Now that we buy goods on line or in shopping centres it is difficult to appreciate just how local shopping was in our grandparents’ time. The Late Victorian housing estates like those in South Tonbridge, the Slade and Barden included some properties originally built as shops and others which were converted later using part of the dwelling for trade. The evidence for these small shops can still be seen in these roads as some houses still retain shop fronts and other properties show the signs of the alterations turning them back into homes. Often there were buildings tucked in behind these houses that were used to store or prepare goods. Many small shops continued in use in some form or other until at least the middle of the 20th century after which it gradually became more difficult for them to compete with the changing shopping trends in the High Street. Taking Barden Road as an example, many of the shops facing the side entrance of the station are still trading, as they are close to the High Street, but further down the road only Barden Stores on the corner of Cromer Road remains open for business in 2011. Once there were many shops along this road serving the basic needs of the local community. The 1919 trade directory lists grocers, a greengrocer, a fruiterer, and a tobacconist. There was a hardware store at No. 84 that later became a grocers and No. 86 was a baker's shop for many years. Another business which started up about this time was a small dairy at No. 100 Barden Road. This property is a semi-detached villa originally built about 1906. Rowland Froud purchased this pair of houses in 1919 and converted one, making the front room into a small shop selling milk, butter and cream. A few years later, a building was constructed at the rear of these houses in which to prepare and bottle the milk. 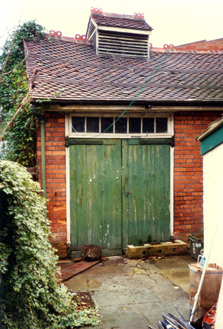 The entrance to this rear building was beside the shop. A paved path led to a pair of large wooden doors opening into the first of two light and airy rooms. Here the milk churns arrived and there were facilities for washing bottles etc and in the second room the walls were lined with white ceramic tiles and there was a sturdy slate shelf on which to process the milk and cream. Ventilation louvres on the roof and plenty of lofty windows helped control the temperature and the floors sloped down to a drainage gully making the parlour easy to clean and hygienic for the standard of that time. 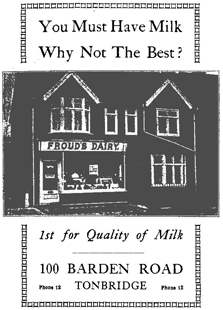 The Dairy business was sold in 1932 to Mr Calvert. Ten years later it was transferred to Sevenoaks Dairy Farms and by 1952 it was part of United Dairies, eventually moving to a large depot off the Shipbourne Road. The dairy shop was returned to a house and the Dairy Parlour and garage recently converted into separate dwellings. These small changes add up to the rich tapestry of urban development which evolves over time.